Childishness is an interesting quality in art. At its best, it’s a doorway to a fresh and uninhibited creativity. When Picasso, for instance, expressed his childishness, it led to marvellous things. Those late sculptures of baboons fashioned from toy cars, or bulls made of bicycle parts, are delightful. The same with Miro, who made a career out of releasing his inner scamp. Or Klee. But get childishness wrong, forget to let down the drawbridge that connects it to adult concerns, and you are left with a childishness that is merely childish. Tinguely was a serial offender on that score. So, alas, was Alexander Calder. It’s unfortunate, because Calder is a popular presence in 20th-century art, especially in his native America, where he is counted among the giants of modernism. His most famous achievement, the invention of the mobile, has had an impact on countless babies’ lives as they stare up from their cots and gurgle happily at the pretty colours dancing above their heads. In the end, though, art is a grown-up’s game. And that’s where it goes wrong for Calder. All this is made clear in an impeccably put-together display at Tate Modern that proves — should anybody need further proof — that the gallery has these kinds of shows down to a T. As with the recent one-person celebrations devoted to Sonia Delaunay, Malevich and Klee, the exhibition-making here is faultless. Even the captions, with their mix of sensible comment, perfectly chosen quotation and striking absence of unhelpful art-world jargon, are probably the best I have read at the Tate. So it’s a shame about the art, which dances prettily above our heads, but never really does more than that. 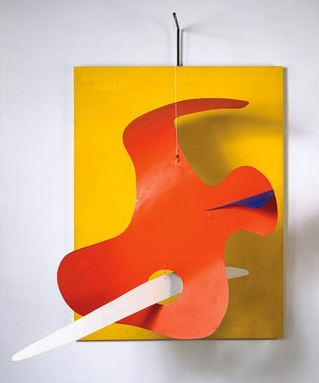 Calder was born in Pennsylvania in 1898, the son of two artists. At college, he studied mechanical engineering. So the artistic and the mechanical collided in him, as is evidenced by everything on show here. This is not a full retrospective. We do not see his first efforts at art, which is a loss, because they might have supplied some different tones to an event that begins as light and trilly as a wind chime, and stays as light and trilly as a wind chime. In 1926, he made his way with eager American predictability to Paris, where he immersed himself in the full avant-garde experience, and where his art settled quickly on a soft surrealism devoted chiefly to that most predictable and ruinous of Paris School obsessions: the circus. Is there anything in Parisian art quite as regrettable as the influence of the circus? I can’t think what it might be. Picasso, with his Saltimbanques, managed to turn it into a haunting metaphor for modern rootlessness; and before him, Toulouse-Lautrec found sexual tension and alienation in the big top. But most of the artists who followed were guilty either of squirting straight-from-the-tube sadness into the faces of their clowns, or of expressing nothing more weighty than a childish liking for balancing acts and bright colours. Calder falls into the second camp. At the show’s beginning, he’s seen showing lots of ingenuity and cheek in a set of sculptures made of bent wire, which he would shape with pliers into the figures of balancing acrobats or circus elephants or, best of all, portraits of his new avant-garde pals in Paris — Léger, Miro, Josephine Baker. These fun portraits are shown suspended from the walls, and quickly make the point that Calder was “drawing in the air” with his sculptural hangings. In Paris, he also began putting on shows of the Cirque Calder, a pocket circus manned by his creations, which he would operate and activate with lots of mechanical jokes and ingenious homemade technology. The circus appealed because its tightropes, its tent poles and its trapezes offered a ready-made example of a sculpture that depended for its impact not on weight or mass, but on thin lines of connection and a sense of movement. All this probably sounds more revolutionary than it looks. There’s a film of the Cirque Calder in action. The first bent-wire sculptures are charming and playful, and it surely took a clever engineer to make them, but once you’ve gurgled at the sight of them, that’s it. No other emotions or visual insights follow. So far, his art has remained figurative. But in 1930, Mondrian invited Calder to his studio. “The shock… converted me,” he later recalled. “It was like the baby being slapped to make [its] lungs start working.” Immediately — too immediately — he became an abstract artist. If abstraction were something you could buy off the peg, that might have been fine. But it isn’t. Great abstraction, like Mondrian’s, is the culmination of an exacting visual journey, not a presentational trick that’s easily learnt. In the large gallery filled with Calder’s first attempts at abstraction, not a single sculpture appears resolved. It’s an impression heightened by the fact that all were made to move, and were fitted with motors; these are now too fragile to work, so in no instance are we seeing the sculpture as Calder intended us to see it. Approached from the side, these unsatisfactory abstract arrangements have the weight distribution you find in garden gnomes with fishing rods. Seen from the front, all are stopped in unsatisfactory mid-action, like broken clocks. It’s evident also that he was not a colourist. Yes, he was bright and used bouncy reds, yellows and blues, but brightness is not rightness, and in the entire show, the only example of genuinely inventive colouration that calls from the wall is the lovely orange-red and mossy green of Snake and the Cross, from 1936. From the motorised kaleidoscopes to the first mobiles is but a tiny step. It’s taken here via a room filled with the best works in the show, a set of sculptures inspired by the movement of stars and constellations, and the scientific instruments used to record them: orreries, celestial spheres and the like. They work because they are fixed in their final positions — a rare moment of certainty at this flighty, itsy-bitsy event. Perversely, it’s the lack of movement that makes them. From here on, it’s mobiles all the way. When Calder returned to America, he returned, you sense, to moods and shapes he recognised from his childhood, and which he tried now to evoke in floaty sculptures that belong, emotionally, at the end of the cot. Snow Flurry, from 1948, is a set of pure white flakes drifting gently down in circles. Black Widow features spidery black shadows that ascend the gallery wall. Other mobiles are reminiscent of autumn leaves on trees. Others still of musical notations and the meetings of quavers and crotchets. All this is charming, but it doesn’t haunt. Driven by a folksy nostalgia for whirligigs and weather vanes, activated by natural breaths and winds, these Miros in the sky seem always to be fishing for oohs and aahs. If modernism were a box of chocolates, Calder would be down in the second layer, among the softest centres.